Rows of red cinema or theater seats isolated on white background. Cinema auditorium in flat style with seats, curtain and blank screen. Movie or theatre hall. Vector. Movie theater with row of red seats popcorn and tickets. Premiere event template. Super Show design. 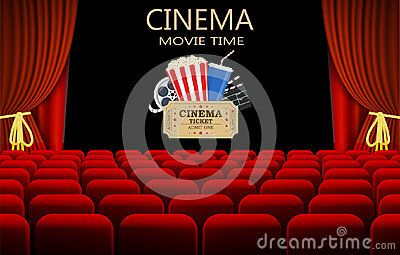 Vector illustration cinema hall with glowing blank screen with place for text and empty red seats in line style.